A Second World War RAF navigator who undertook daring missions to help the French Resistance behind enemy lines is to be awarded the Légion d’honneur, the highest honour the French government can bestow. 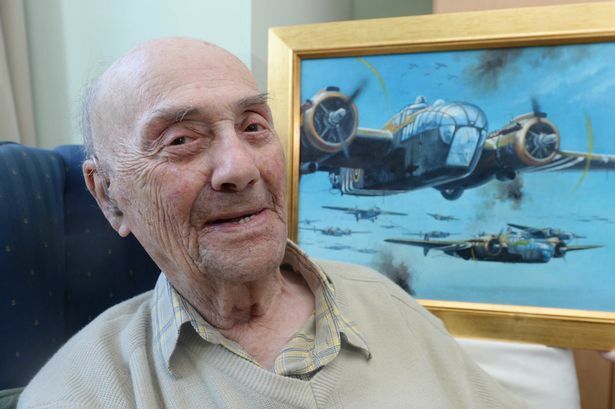 Bill Barfoot, 95, of Oaktree Lane, Bournville, is being recognised for his service as a navigator in the RAF on D-Day and for the supply drops he completed for the SAS, undercover agents and the French Resistance. Mr Barfoot was born in Newcastle in 1919 but moved to India when he was six years old, where his father was a police officer. He was married to Doreen, who served in the Women’s Auxiliary Air Force during the war, for 69 years until her death in 2013. They moved to Birmingham after the war where Mr Barfoot became Station Commander at Castle Bromwich Aerodrome in 1954 and oversaw a number of Battle of Britain display ceremonies. Mr Barfoot remembers his time in the RAF fondly: “I very much enjoyed my time in the air force and I would have liked it to have gone on longer. “One time I woke up feeling rain was falling against my face and I looked around to see I was in a field. For a moment his voice falters and he remembers the Holocaust concentration camp survivors he helped repatriate to Greece after the war. “I remember showing one woman the Acropolis as we flew past Athens and a tear came to her eye,” he recalls with a tear in his own. Of D-Day itself, he remembers it as any other day: “To me it felt like another operational day, but of course we were heavily protected by Typhoons and Spitfires. Mr Barfoot took extra precaution when transporting French Resistance fighters in case they were secretly working for the Nazis. Mr Barfoot also saw action at the Battle of Arnhem and the Rhine Crossing and navigated in Armstrong Whitworth Albemarle and Halifax aircraft. She and her brother Nigel have helped to organise the ceremony that will also be attended by a French Air Commander.